BUILD is an exhibition, an instruction, a selection of new works by artists and architects whose individual practices that span architecture, painting and sculpture brought together under the common theme of the built environment. Although there is a certain amount of difference between the way that architects and fine artists work it has become increasingly common for these practices to crossover and inform the other through collaboration or interdisciplinary modes of working. In a similarly way to that of Le Corbusier whose work spanned many forms including; architecture, painting, town planning, interior design, book design and sculpture drawing influences across the board. 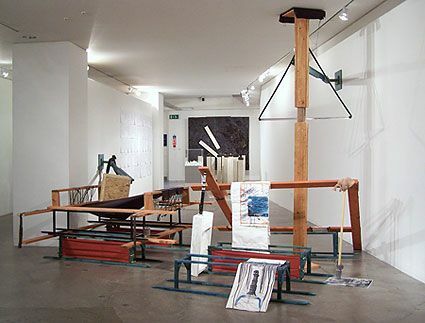 Ralph Dorey has created a large sculptural installation of timber and plywood to fit around the architecture of Blyth Gallery. With echoes of both continual exploration and geographical occupation this structural language pushes into and is stabilised by the existing space. In some ways it reinforces a sense of something mobile and adaptable yet it is unshakably anchored in place, braced against impact but equally ready to move. Heidi Locher's installation works with the architectural concept of noting space using concrete markers to create both space and movement. Using basic building materials she has constructed a series of columns which become markers of mortality. These markers carry dark matter which have been smashed and flung, culminating in a large black purple canvas which carries two broken beams that have been hurled towards the canvas, suggesting the process of pent up emotion and energy. Richard Cramp has built small works that inhabit the cabinet spaces within the gallery. Fitting into the existing architecture, these miniature environments have been created to evoke the viewer to consider narrative, space and perception of the recognisable features. The cabinet gives this small scale habitation an air of security or perhaps a false illusion of some sort of Utopian existence where the glass door seals it from the outside world. He aims to evoke a sense of play, adventure, intrigue and excitement through the use of scale, suggested narrative and the use materials. Mobile Studio presents a new satirical work entitled 'A Vision of Britain' that draws on current debates over the Prince of Wales's controversial interventions into the UK Planning process. 'A Vision of Britain' takes the form of a game, continuing in the tradition of artists Chess Sets, that acts as metaphor for the continuing debate on taste, style and the future of British Housing, Architecture + Planning.